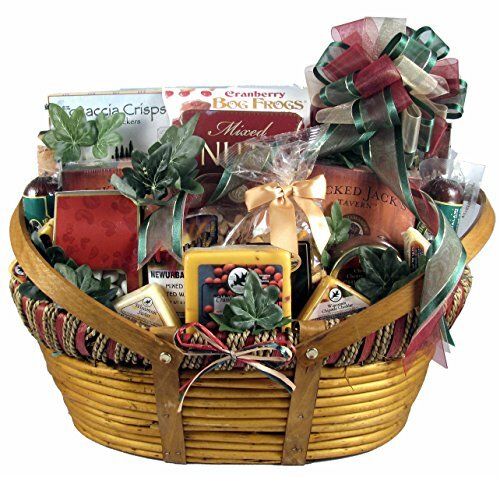 This best seller is the largest of our Midwesterner gift baskets. The xl version of this very popular gift basket includes: gourmet focaccia crisp crackers cranberry cheddar gourmet cheese Wisconsin Swiss cheese Wisconsin cheddar cheese a jar of delicious green olive and pimento cheese dip jumbo cashews and peanuts "nik naks" cocktail mix assorted dipping mustard beef salami all beef summer sausage with cranberries (delicious.) Mint chocolate wafer cookies cranberry bog frogs (sweetened dried cranberries and cashews smothered with caramel and chocolate) bourbon vanilla dessert twists chocolate salted caramel cookies deliciously moist chocolate rum cake dipping pretzels onion blossom horseradish dip pepper cheese classic flavored Tortuga Cayman island rum cake assorted German chocolate dipped cookies dads scotch oatmeal cookies stoned wheat crackers pillow chocolate filled cookies tiramisu cream filled cookies mixed caramel chews mocha almonds smoked salmon (4 ounce) mixed nuts chipotle cheddar cheese garden vegetable cheese assorted biscotti. Enhance your gift basket with a beautiful deluxe 2 tone, 5.75 inch x 8 inch cutting board/serving platter made from eco-friendly bamboo tucked inside the basket-see product options. View More In Snack Gifts. If you have any questions about this product by Gift Basket Village, contact us by completing and submitting the form below. If you are looking for a specif part number, please include it with your message.